Dozens Dead, More Feared Lost, After Shipwreck Off Sicily : The Two-Way A ship packed with African migrants trying to reach Italy apparently caught fire before sinking. It's thought there were about 500 people on board. The vessel had set off from Libya, authorities say. 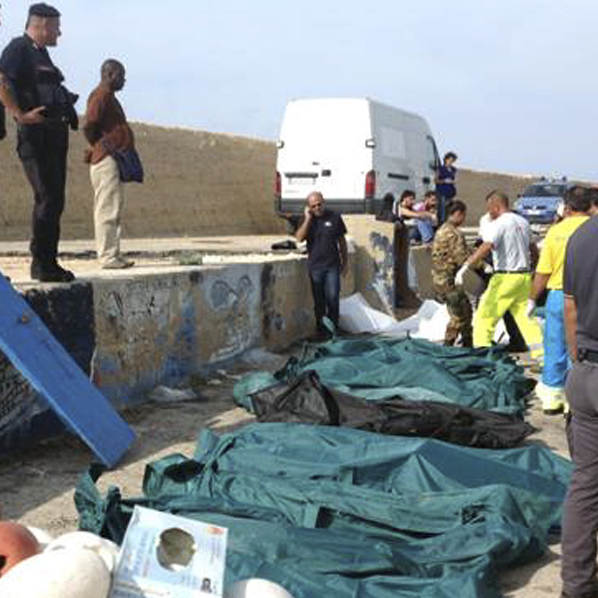 Some of the victims recovered after Thursday's wreck of a ship near Sicily were placed in body bags before being brought ashore to the island of Lampedusa. "A ship carrying African migrants to Europe caught fire and capsized off the Italian island of Lampedusa on Thursday, killing at least 94 people as it spilled hundreds of passengers into the sea, officials said. Over 150 people were rescued but some 200 others were still unaccounted-for." According to the BBC, "there are reports that a fire broke out on board before the boat sank. It was believed to have been carrying about 500 people. The boat had set off from Libya and many of those on board were migrants from Eritrea, according to UNHCR spokesman Laurens Jolles in Rome." "Thousands of desperate migrants from Africa arrive in Italy on unsafe, overcrowded vessels every year, with most coming to Lampedusa, a tiny island just 70 miles from the coast of Tunisia. Numbers have been boosted this year by thousands of refugees from the civil war in Syria, most of whom have arrived on the eastern coast of Sicily from Egypt." Note: As disasters such as this unfold, news accounts about the number of people killed and injured often vary until authorities have a chance to fully document what happened. We'll update as more information comes in.